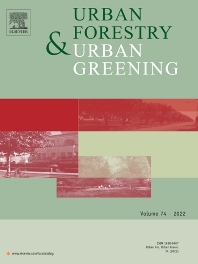 Urban Forestry and Urban Greening is a refereed, international journal aimed at presenting high-quality research with urban and peri-urban woody and non-woody vegetation and its use, planning, design, establishment and management as its main topics. Urban Forestry and Urban Greening concentrates on all tree-dominated (as joint together in the urban forest) as well as other green resources in and around urban areas, such as woodlands, public and private urban parks and gardens, urban nature areas, street tree and square plantations, botanical gardens and cemeteries. Form and functions of urban forests and other vegetation, including aspects of urban ecology. Policy-making, planning and design related to urban forests and other vegetation. Selection and establishment of tree resources and other vegetation for urban environments. Management of urban forests and other vegetation. Original contributions of a high academic standard are invited from a wide range of disciplines and fields, including forestry, biology, horticulture, arboriculture, landscape ecology, pathology, soil science, hydrology, landscape architecture, landscape planning, urban planning and design, economics, sociology, environmental psychology, public health, and education. Special attention will be given to interdisciplinary research as developed under the approaches of, for example, urban forestry, arboriculture, urban greening, urban ecology, urban health, urban agriculture, urban horticulture, urban silviculture, and community forestry.